As well as trading stocks, commodities and currencies, online trading traders have access to a number of indices from around the world. 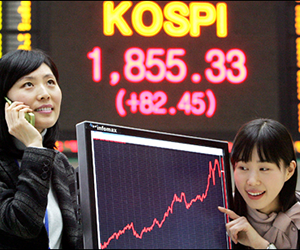 The Korean Composite Stock Price Index (KOSPI) (코스피지수) represents all of the common stock on the stock exchange. Originally it consisted of only the top 30 in a Dow Jones style index. The index is calculated through market capitalization. This index is interesting in that it factors in all companies rather than a selection. Other indices like the FTSE 100, CAC 40, DAX 30 and so on are limited to the top companies. Samsung Electronics (005930), Korean Electric Power (015760), POSCO (005490), Hyundai Motor (005380), Kia Motors (000270), Hyundai Mobis (012330), LG Chemical (051910), Samsung Life Insurance (032830), Hyundai Heavy Industries (009540) and Shinhan Financial Group (055550). Online trading brokers that have a particular affinity for Korean companies will often choose this index in order to diversify the assets on which they trade. A strong Korean economy will mean bullish trends in the KOSPI, so traders should look for indications of positivity from politics and economic indicators. Naturally, the index is also heavily correlated with the DOW Jones and the rest of the world economy. Are you interested in trading online trading on the KOSPI ?